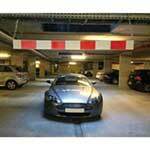 Height restriction barrier with red & white plank ideal for car parks. Height restriction barriers are commonly used in car parks and other locations where clearance between vehicles and ceilings may be an issue. 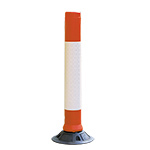 The red and white paint and reflective finish helps the barrier is stay visible during all driving conditions, with the aim of alerting drivers in an attempt to prevent large vans and HGVs from getting into trouble. One side of the lightweight, plastic barrier is supplied in a reflective finish to match all the latest regulations while two lots of 2m plastic suspension chain (6mm) is included with the barrier allowing you total control over setting the required height of the barrier.